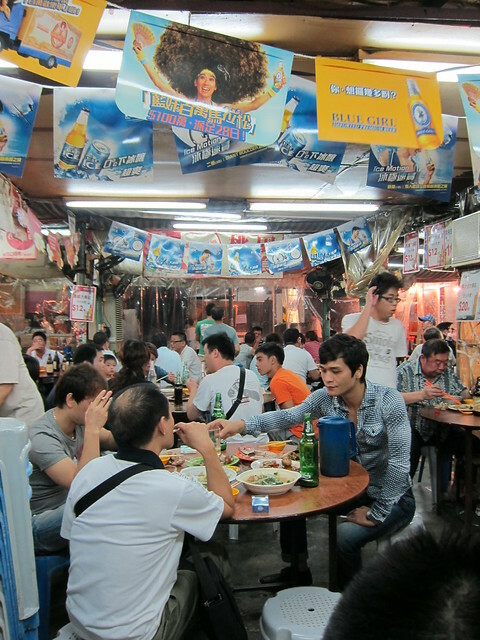 The One With Woosung Street Food Hawker Bazaar – Chiu Chow Undefined? I have been contemplating about writing this post for quite sometime now. My hesitation stemmed from various reasons: (1) I am not sure if the food I am eating is indeed, chiu chow food, and (2) for the life of me I can’t seem to recall the name of the food I ate, and (3) the fear that even if I do write the post, it will not be useful to you. So why did I decide to write it anyway? That’s because I loved the place. I specifically told my better half that I wanted to go to this particular food hawker bazaar as we have walked past it several times in the past and it was always bustling with people. With that kind of crowd, the food bound to be good, no? Well, yes and no. If you are the kind of diner who can queasy at the sight of rickety chairs, wet concrete floor and harried waiters, this place is not for you. The food adventurer in me was in full force that night; I was happy to just jab at the menu randomly (I can’t read Chinese) and eat whatever came. Of course my better half intervened, otherwise the dinner would have been a total disaster. It may come as a surprise to you, but not many Hong Kong-ers fancy vegetarian food. At least, not in my circle of friends. When I floated the idea of having a vegetarian meal, I met with an array of ridicule, from the polite to the downright rude. “Why the f*ck do you want to spend your money on rubbery fake meat? Get a life”. Of course, I am exaggerating. But only just. Vegetarian meat – fake meat, faux meat, whatever you want to call it – is not to everyone’s taste. Though after my experience at Ying Vegetarian, I couldn’t understand why not. My partner-in-crime for the night was Adaline, whom enlightened me on the story behind vegetarian meat. It was told that in ancient times, Chinese emperors visiting Buddhist temples were welcomed by the monks with such meat, effectively fusing vegetarian practices with the taste of the meat-eating royalty. Counterfeiting meat? Perhaps. 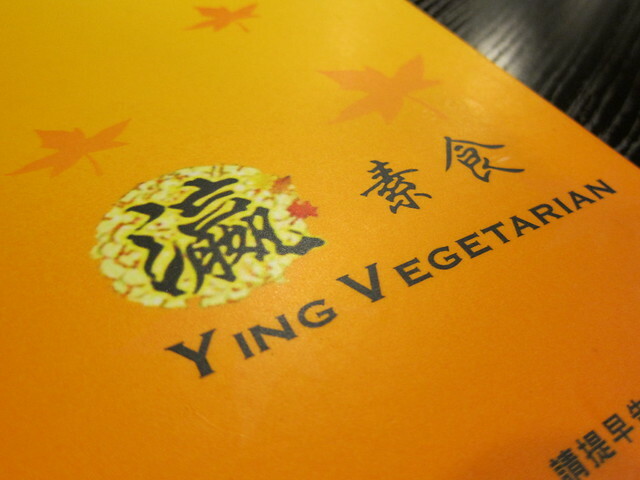 Ying Vegetarian did it with such perfection, it was impossible not to be dazzled by such gastronomical wizardry. Throughout the meal, often I had to take a pause and remind myself that hey, I was NOT eating meat. This piece of delicious looking sashimi in between my chopsticks is not of piece of salmon; it was a piece of non-meat sashimi expertly made from soy, tofu and similar ingredients. Not too long ago, I blogged my virgin experience dining at Goccia; one of those true Italian gems located right in the smack of Lan Kwai Fong. The delectable dinner I had was still lingering in my mind (and on my tongue, obviously) when I found myself at Goccia again one weekday night. 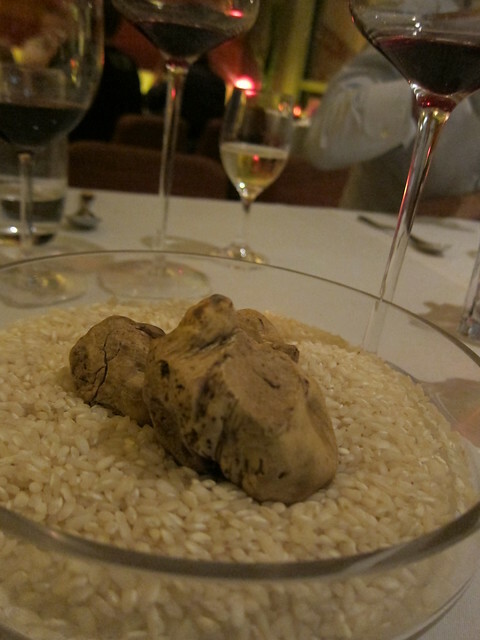 My second visit was to try out their tasting menu for Alba white truffle. Known as the white diamond of the gourmet world, white truffle can be found from northern Italy, more famously from around the city of Alba. While the black variety is more hearty and can be used rather generously, white truffle is much more pungent; so much so that only shavings of it should be used with food. That, and also because white truffle is notoriously expensive. One gram of it can set you back by as much as HK$120. How do you best describe having white truffles with your food? It is like… having sugar with your coffee. It can only make food taste better. With that in mind, my palate was all set to see how Alba white truffle will set my dinner on fire. You should know that I am a Groupon junkie. I read their daily deals with a passion bordering on fanatical. On average I buy two groupons every week. If they have a VIP club, I will be the first to sign up. Ironically I only subscribed to Groupon’s mailing list, and one other. I was blissfully unaware of the existence of other group buying sites in Hong Kong. Probably a blessing in disguise, seeing my penchant for a good deal. My credit card bills may soon arrive in multiple envelopes. A little dig resulted in a list of such sites that is mind boggling. Not quite yet Singapore, but close. Here’s a list, categorised into bilingual, English, Chinese, and yet-to-be-launched. A pity (for me) that the English list is so short. I think I found a market gap here. This list is a work in progress and will be updated from time to time, so do bookmark and check back often. If you know of any site I have missed out, leave a comment! I first came across Linguini Fini on Twitter. I am an advocate on the use of social media to build a loyal fan base to one’s brand, and the best example I could quote would be The Garden Slug in Singapore. Linguini Fini comes a close second in being very responsive on Twitter without being overly promotional. Of course, it also helps that many of my foodie friends loved it. Just ask Jason, Rita or JJ. I have heard of many good things about the place, but the fate was sealed when my buddy, who is one tough master to please when it comes to food even at the best of time, sang praises of Linguini Fini and even returned for a second meal within the month. I had to pay a visit. 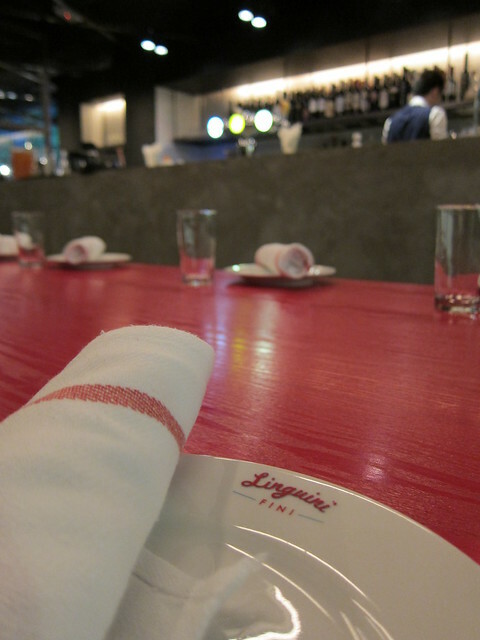 The first thing you should know about Linguini Fini is that it does not take reservation. True to its NYC-root, you can only walk in, and even so you will be seated only when everyone in your group has arrived. This might come across as strange in Hong Kong food scene, when some places put too much importance on their waiting lists and think you owe them for food. But for me, I was delighted. No more coming to an empty restaurant only to be told it was fully booked for the night; the vacant tables almost mocking you. 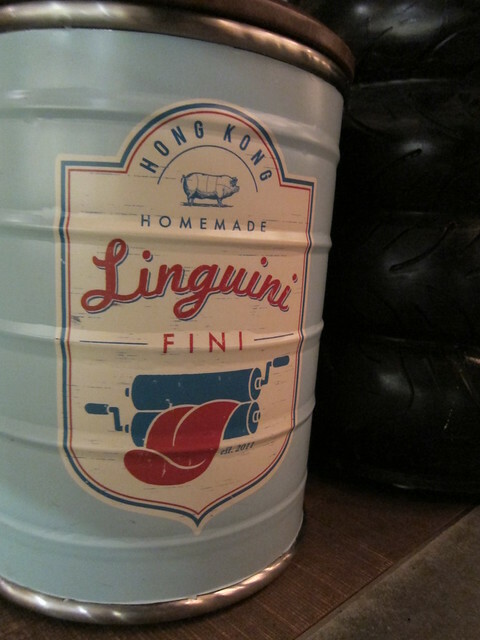 Linguini Fini has a very laid back feel to it. With its pastel-coloured barn-like furniture, barrel seats and tables, low and warm lighting, playful music playing in the air… I was happy to be waiting for my friend (yes, that friend, returning for the third time) just to soak in the atmosphere. Am I bias? Perhaps. But you can’t deny truly good food. The One With ABC Kitchen – A Better Cooking Kitchen? 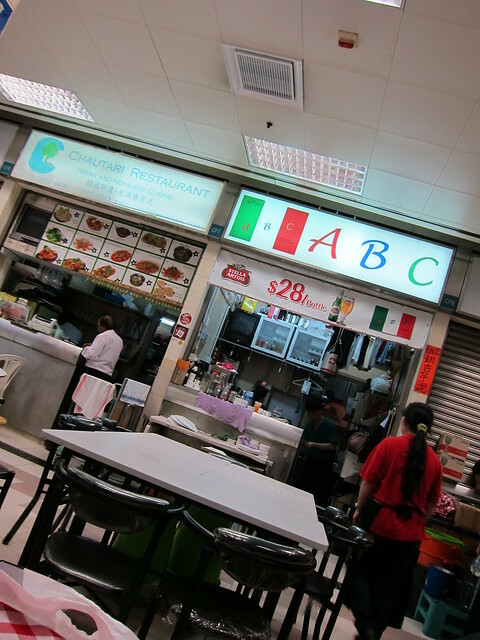 ABC Kitchen is like an institution in foodie circles around Hong Kong. Those I have spoken to have high regards for the nondescript stall, located at one of wet markets at west part of the island. Finding the place could be tricky; a tiny escalator led up to the cooked food center through a pair of dirty glass doors. Even after passing through, you might be confused by the array of Chinese, Indian and Thai food stalls lining up its walls. But look a little harder and the cluster of tables with charmingly checkered table clothes will cone into view. Another hint: More than half of its clientele was made up of Westerners. Yes, gweilos and gweipos swirling glasses of red wine in a wet market. 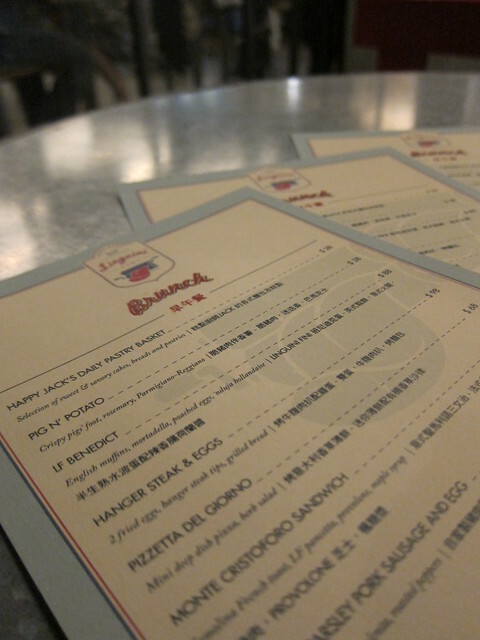 As one of my closest Singaporean friends were in town, I was eager to show him some of the better places to eat at in Hong Kong. Hence I made an advance reservation at this place, at an ungodly hour of 9.00 p.m., hoping to escape the dinner crowd. Things didn’t bode well that when we arrive, we were told our table is not ready, there are no seats for us to wait, and could we please return some twenty minutes later. To give them credit, they gave me a call on the dot when a table was ready for us. So we settled down for business and made some choices from the somewhat limited menu. I have had it with people who have nothing good to say about the social buying business, like Groupon. I have had the opportunity to dwell into the details of this new industry, and it was nothing short of being fascinating. Of course, the recent bad rep of Groupon – from its IPO chaos to disgruntled customers to vocal naysayers – didn’t help matter. 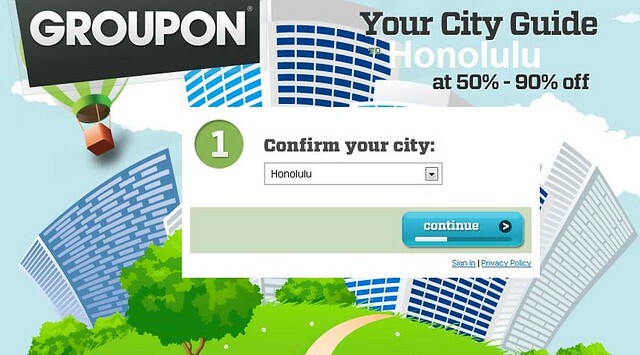 So I am going to put forward my take on Groupon on other similar social buying sites to everyone. Fact: Groupon helps your business. Also fact: Most businesses do not understand how to make it work with Groupon. As someone who has more than my fair share of Groupon experience, I can honestly say I have more insights than most people.